As is typical in every California election cycle, there will be several propositions on the ballot. And as always, there are usually a few that draw the most attention. This year Propositions 6 and 10 seem to be drawing the most attention. Proposition 6, which seeks to repeal the gasoline sales tax vehicle registration fee hikes signed into law last year by Gov. Jerry Brown, is being opposed by a broad coalition. That coalition in Elk Grove includes all three mayoral and city council candidates. The other ballot measure drawing passion - and money - is Proposition 10. This measure, if approved, would repeal the Costa Hawkins Rental Housing Act that limited local jurisdictions ability to impose rent control. 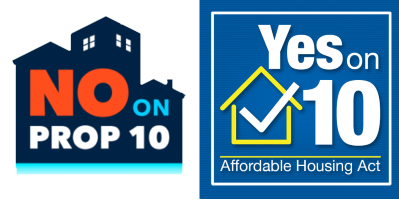 A yes vote on Proposition 10 would repeal Costa Hawkins and thus enabling local jurisdictions to adopt rent controls. Conversely, a no vote on the proposition would leave Costa Hawkins untouched. This proposition is being argued by both sides in the context of California housing affordability and the rapidly escalating homeless population. Yes proponents claim it will provide local jurisdictions if they so choose, a tool to address housing affordability in their community. The opposition says if the proposition is approved, it will have the opposite effect and discourage new housing development that is needed to alleviate housing shortages. There are a host of business interests that are seeking to defeat the proposition. Not surprisingly these interests are well-funded, and according to current information from the California Fair Political Practices Commission, no on 10 has raised $30,430,775 to the proponents, who have generated funds totaling $13,420,200. Of course, those opposing any sniff of rent controls, are not limiting their efforts to the no on 10 campaign, they are hedging their bets. A good example of this is the California Apartment Association's political action committee. According to information posted on the California Secretary of State's website, the CAA has been actively contributing to candidates statewide on many levels. Not surprisingly, CAA has donated to county supervisors and city council members. Among those that the CAA has contributed to include three members of the Elk Grove City Council. According to CAA's disclosure, on September 15 they gave $2,500 each to council members Stephanie Nguyen and Pat Hume, both of whom are on this November's ballot, and Vice Mayor Darren Suen who is seeking the mayor's office. This is a smart move from the perspective of the CAA. Even if Proposition 10 wins, which polls indicate will not happen, they will still have influence with supervisors and elected official throughout the state. Should Hume, Nguyen, and Suen, either as a council member or mayor, retain their seats, the CAA will have gained their attention via their campaign contributions. As those who follow Elk Grove politics know, rarely if ever have any council member voted against the interest of those who finance their campaigns so do not expect to see anything resembling rent control in Elk Grove for the next several years regardless of the outcome on Proposition 10 .